The Star (link dead): packs in unbelievable lots of features, including dual-functions as camera and camorder. Even better, it can also take still shots while recording. This means that if I see something interesting while recording, I can just press the shutter button to snap a picture of it. It will be then stored as a still shot. Overall, the S600 makes a great training camera for beginners who are thinking about sharpening their photography skills. 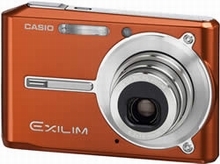 DigitalCameraInfo (link dead): The EX-S600 isn’t our style. It’s very small and the design is bold, but the sad fact is that these are the most appealing things about the camera, and they won’t help anyone take pictures. We appreciate that the camera is made of metal, but that’s only a good start at making a durable imager. A camera is only as tough as its most vulnerable part, and the EX-S600’slens assembly and unsealed battery and memory compartment are pretty vulnerable. If the color and size were wrapped around a good imaging system, if the camera were tough enough to go where it can fit, and if it were easy to hold securely, we’d be enthusiastic. As it stands, there is clearly a market for tiny cameras; however, they generally come with some compromises. Unfortunately, for the S600, one of them is image quality.